Summer is officially over, and most of us are excited about a new season bringing crisp air and lots of family fun. Fall is the perfect time to cozy up at home and spend some time catching up with the kids after the first few hectic weeks of school and adjusting to new schedules. We’ve got you covered with some great family fun, so grab your pumpkin spice latte, some craft supplies, and the kids – let’s celebrate fall! Apples and leaves and pumpkins, oh, my! These are just a few of our favorite symbols of fall, and there are so many great activities to explore on these themes. Are you going apple picking with the kids, or just want something to fill a rainy Saturday afternoon at home? There are so many great recipes and crafts to do with apples, and you can pick a few of your favorites to make with your preschooler. Cut an apple in half from side-to-side, not top-to-bottom, brush on some red paint, and let the little ones stamp apple shapes onto white paper. Don’t forget to show them that when you cut an apple this way, the seeds form a surprise star shape! Talk about how those seeds are planted to become the apple trees that you may have seen at the orchard, and you can even talk about the legend of Johnny Appleseed. There are lots of books at the library on this famous folk hero, as well as tons of great coloring pages and activities about apples online! Older kids may enjoy helping you make homemade applesauce, apple pie, or cobbler with your bounty from the orchard (or supermarket). Grab some cider from the store to warm on the stove for a comfy fall dessert! Little ones can even roll apples on the floor and see who can roll theirs the furthest, with Mom, Dad, or a sibling measuring the results. And, hey, these slightly bruised apples are perfect for that applesauce. Don’t forget that bedtime story after your apple day fun. Some of our favorites are Apple Pie ABC by Alison Murray, Autumn is for Apples by Michelle Knudsen or Amelia Bedelia’s First Apple Pie by Herman Parish. And there are plenty of others to choose from at your local library! Yes, that yard full of leaves is a headache for parents, but it’s definitely fun for the kids. But while you’re outside raking up all those leaves, why not make it fun for the kids? And just maybe, they’ll help bag them up after they play in a leaf maze! Just rake leaves into small rows so the little ones can follow the path of the grass that’s been exposed. It can be super easy or more challenging for the older kids. You can even have a treat waiting at the end of the maze – some apple cider donuts and hot chocolate, maybe? Before you bag them all up, though, grab a handful of the most beautiful ones to make a few fun projects. Having a craft time in the evening can be a good incentive to get the yard cleaned up as a family! Small children can do leaf rubbings by placing leaves under thin white paper and using crayons in their favorite fall colors to rub over the top. They’ll be amazed as the details of the leaf appear before their eyes. Just like with the apples, you can make leaf prints by spreading a thin layer of paint on the leaves and pressing them onto paper. Or the kids can pick out different sizes and shapes of leaves, glue some wiggly eyes on them, and make leaf “people.” They can get creative and glue them to paper, draw arms and legs, or add yarn hair or other accessories with craft supplies you have on hand. Older kids can make beautiful decorations for the house by preserving leaves. There are several easy methods to do this, but all of them require an adult’s supervision. Leaves can be dipped in a bath of glycerin purchased from the craft store and dried. They can also be dipped in melted paraffin wax or ironed between two sheets of waxed paper. For little ones, brush both sides of a leaf with regular white glue, allowing one side to dry completely before doing the other side for a much easier technique. These preserved leaves can be made into a garland or glued onto a paper towel tube that has been cut into rings to be used as napkin rings. Or they are beautiful on their own scattered across the dinner table or displayed in a bowl. When you’re done eating dinner and enjoying your table decorations, sit down for a great story like Red Leaf, Yellow Leaf by Lois Ehlert, Let It Fall by Maryann Cocca-Leffler, or We’re Going On a Leaf Hunt by Steve Metzger. And if you made leaf “people,” Ehlert also wrote a fun book called Leaf Man. You may even want to make a fun snack to share during storytime. Just buy a leaf-shaped cookie cutter at the craft store, make a batch of sugar cookie dough (or that parent favorite, a roll of cookie dough already made for you), and decorate with sprinkles or frosting in autumn hues. You know we can’t forget about pumpkins! There’s something about these little gems that brings a smile to everyone’s face – and, of course, there are plenty of fun pumpkin activities. Kids can decorate pumpkins for fall well before Halloween by painting them with designs or gluing on buttons, yarn, scraps of paper or fabric – the options are only limited to their imaginations. Just mix 2 cups of flour, 2 tablespoons of vegetable oil, a half-cup of salt, 2 tablespoons cream of tartar, and then add a cup to a cup-and-a-half of boiling water until it begins to get shiny and become the desired consistency. Then, simply add orange food coloring and some store-bought pumpkin pie spice to make this great – and safe — dough for the kids. They can roll balls into pumpkin shapes, use a pumpkin cookie cutter, or even make pretend pumpkin pie in disposable pie tins. And we can’t forget that all-important pumpkin-themed treat. Just whip up a batch of rice krispies treats, add some orange food coloring, and form into balls (with buttered hands). Add a mini Tootsie Roll for a stem and that’s all there is to it! Of course, we have some cherished books about pumpkins you can read as you wind down for the day. Some of our favorites are The Runaway Pumpkin by Kevin Lewis, Too Many Pumpkins by Linda White, and Pumpkin Soup by Helen Cooper. Who doesn’t love this time of year? There’s just a feeling of excitement in the air, the dog days of summer heat are over, and there are so many fun things for families to do. 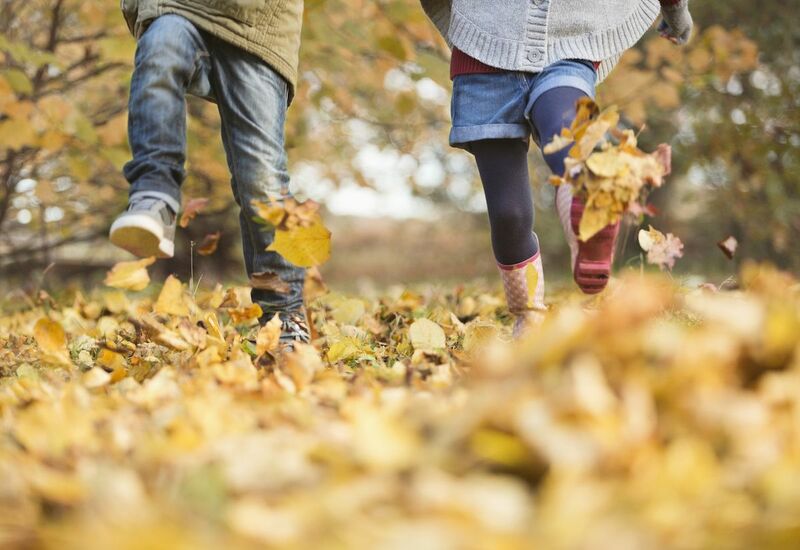 Do you have any great fall craft ideas for kids, or do you have a favorite family activity to do this time of year? Leave us your ideas!